Thank you very much Coach. That sounds like just what the doctor ordered. to help me out in this problem. I will order it today and give it a test run. As long as it doesn't react to the ink and make the ink to run. Thank you so very much. BTW-read your e-mail first before I came here to the forum in case you were interested. It's been a difficult Sunday morning for me. This stuff sound like it has a lot of different uses and will solve a lot of problems I have been having. I use that glue for a lot of things. I initially got it for some balsa models I was working on. It works really well with balsa. Then I experimented with the paper. As long as you use very light coats, it will not affect the ink. If you glob it on and let it sit, it will slightly discolor the printed areas. I catch myself with this every once in a while. The antennae and tail gear are also perfect candidates for the glue. They are so flimsy. You're using a brush? I usually just whittle down the end of a toothpick so that it's flat and spread the glue with that. I could probably just use flat toothpicks, but they're too flimsy for my liking. Gluing the back side should work perfectly. As far as getting the glue off I usually pull apart any stuck appendages asap and then let it dry. It flakes off after a couple of hours, especially if you bend and squeeze your fingers. Landing Gear Down and locked. The skytrain is coming along nicely. Sure is good to see the parts altogether. I think you deserve something nice and smooth. One of the jets should be good. The DC-9 is pretty strait forward. Almost all tube. The F-84 isn't too bad either. Your Skytrain looks great! It's always good to see the fruits of your labor when a project comes to completion. A fine ending to a build that shows everyone that perseverance will pay off. 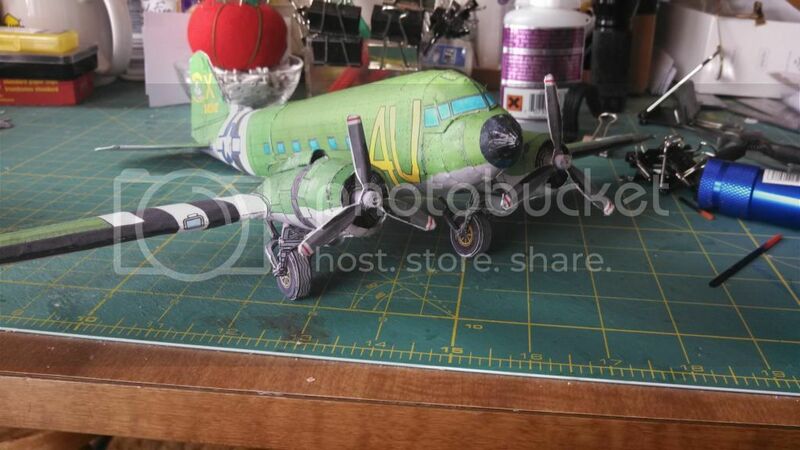 I also want to make this one of my projects, but it has to wait in line for my other models to be built as I have 4 others in some type of construction.